Word Zen is rated 3.6 out of 5 by 13. Rated 5 out of 5 by pennmom36 from Word Zen This is a word game in the form of Mahjong tiles with the goal to spell words with the available tiles. Each letter has a number value and every level has a bonus word that gives you extra points. 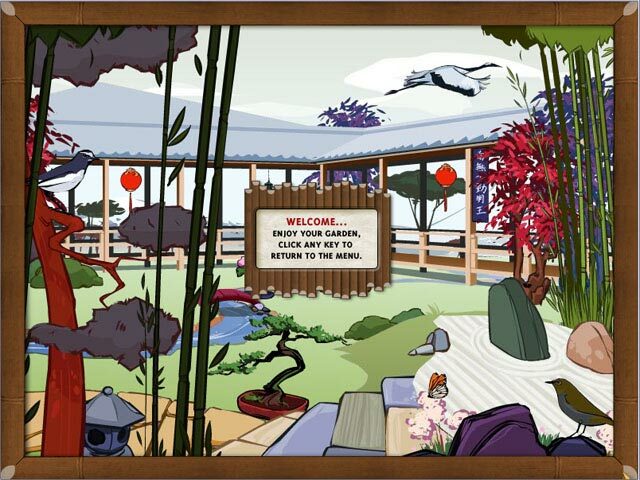 After each level you get an addition to your "zen" garden which starts out as empty land and transforms into a happy place. Rated 5 out of 5 by Misch1ef from Challenge yourself this is a great game. It is challenging when you get to the higher levels. Much more so than other scrabble type games. Rated 5 out of 5 by DRAGONWYN from Mind stretching and addictive. Love it. Very addictive and challanging. Keeps the mind alert after being bored all night at work. Nice music. Unique combo of games. Bought it for my 72 yr old mom who wanted it and I can't stop playing it. Rated 5 out of 5 by Mimama52 from Great Word Game! HPmini compatible I really like this game, it very relaxing and addicting. 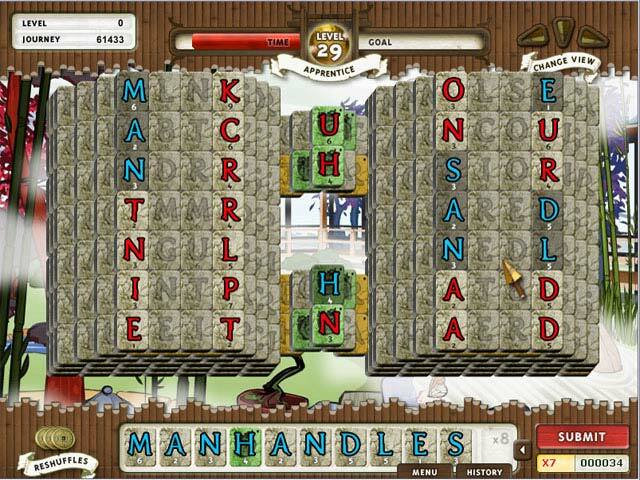 You can enjoy your garden from the main screen and your scores page keeps your longest and most valuable words. This game plays well without changing my Hp Mini's resolution however it does cut off the bottom of the screen, where the menu buttons are found but none of the game play area is hidden so you are still able to see enough of the buttons to play. p.s. The Esc key also works on this game. Rated 5 out of 5 by vonissk1 from Awesome challenging game I really like this game. It has an awesome array of letters and is a challenge with so many Q's, Z's, and J's. I also like there are a lot of S's and EDs to make longer words. Rated 4 out of 5 by morlaine from I liked this concept of this game but if you have a large vocabulary you may find it frustrating I like this game because it challenges the brain and if you win the level, then you add accessories to a beautiful and peaceful Asian type picture. The reason I didn't give it five stars was because the dictionary is very limited. There were many words that I tried to use but they were not found in their dictionary. That part I did not like. Looking at the reviews I'm not the only person who was frustrated by this. I hope the developers take our suggestions and add some really good comprehensive dictionaries to the game. I would also like the ability to have words longer than 11 characters even if you didn't get points for the extra letters. Or maybe up that limit to 15 characters. I think the game is a great concept even better than Scrabble because you aren't limited to seven letters AND you get to choose your letters. If it had all these options I would have given the game 10 stars. I really liked it but it needs enhancing. I recommend that you give this game a try I think you will enjoy it. 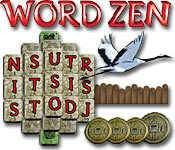 Rated 4 out of 5 by mrm2006 from Very Much Like Scrabble If you like Scrabble you will very much like Word Zen. Storyline: None that I'm aware of. Graphics: A bit grainy but not enough to impair your vision to play the game. Sound: Music was very relaxing. Gameplay: There are 4 levels of difficulty - Easy, Novice, Master and GrandMaster.T here are tiles (as in a Mahjong game) and layouts (as in a Mahjong game) except instead of pictures, etc. you have letters - ala Scrabble. All of the letters have a worth to them in order to win points. Some letters will also have colors - indicating a bonus to assist you, however, beware because you may use a colored letter that doesn't help you at all but hinders you. There is a "help" section as opposed to a tutorial. In the beginning I was moving and shaking - 10 letter words - using rare letters like "J", Q" and "X" to get points and bonuses from colored tiles. I didn't need more than 2 or 3 words at that rate. However, having said this, the game does get exponentially harder and harder and harder. I am well-read and can use a $10 word when I need to but I finally got to a level that flummoxed me. I replayed over and over and over and over because (1) time ran out and (2) the colored letters that would have helped me a LOT were buried far below in the layout and I just could not get to them. Therefore, is it better in a situation like that to try to build big words with many tiles or just a whole shebang of little words to keep the game moving? Only a seasoned Scrabble player can answer that. And me? I am barely a novice at Scrabble so this game really isn't for me. This Glam-ma won't be purchasing this game but only because I am not a word game kind of person but as far as I did get? I most thoroughly enjoyed myself and believe you will too. Happy Gaming. Rated 4 out of 5 by schitzotje from One of the best combined games I know.. If you're liking "Mahyong" and "Bookworm", this is the game for you!! It has been mixed up very nicely... On a Mahyong-board you are challenged to submit as many words as possible (min. 3 letters) giving you additional Bonus Words for extra points. Along the way, some letters are multiplied for a better score..! 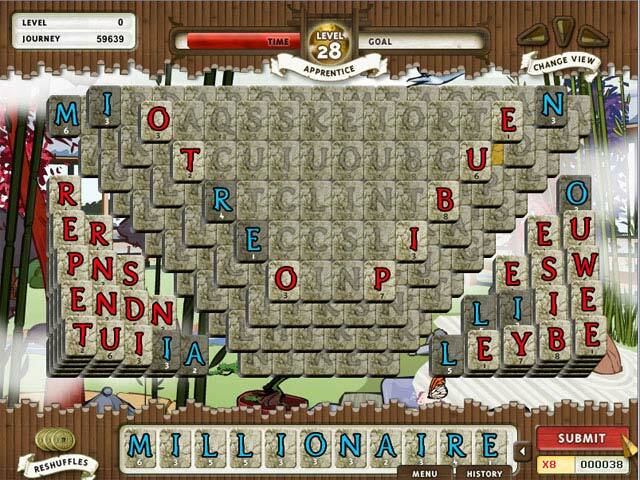 Rated 3 out of 5 by sereneorchid from For Scrabble fans Mahjong is only represented in the layout of tiles. Otherwise, it's using letters to form words, like Scrabble. The game started off locking by up my Vista computer, and ran on the slow side after that even after adjusting the options. The other issue for me is the timer, which runs out pretty fast and ends the game. If you aren't good at Scrabble, I don't think you'll enjoy this or find it easy. Rated 2 out of 5 by oldladyplaying from Another game ruined by being timed.. At risk of repeating myself, I truly hate timed games! If devs would only put that fact into their descriptions, I could save myself a lot of time. Game is really fun & challenging even for me, a person who has dealt with words, speech & other language applications for my whole life. I just want to relax & play w/out timers & nagging little things/characters who hassle me to go faster. Please, devs, knock it off!